If you're willing to believe a Chinese website by the name of “911sniper,” then you may be excited to hear that HTC is prepping two new Froyo-running handsets with Sense on top, though neither will be “superphones” or very ground-breaking. The first handset, called the HTC Lexikon, has a 3.8” 480x800 resolution screen with a 5MP camera and an 800 MHz processor and a full QWERTY keyboard. Nothing mind-blowing, but with this and the Samsung Intercept, it’s nice to see 800 MHz becoming the standard for mid-range Android phones. On the other hand, we have the HTC Bee, with a 3.2” 240x320 resolution screen, a 5MP camera with flash, and a 528 MHz processor. This one worries me: it’s clearly made as a low-end phone, but the specs still seem very outdated (even Motorola’s recent low-end offerings have a 600 MHz processor). 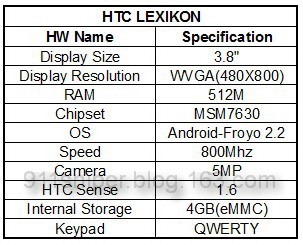 In fact, the screen and processor specs match up with the G1, which was released almost two years ago. As always, these are still just rumors, and we don’t have any hard evidence (pictures or videos) to back these specs up.